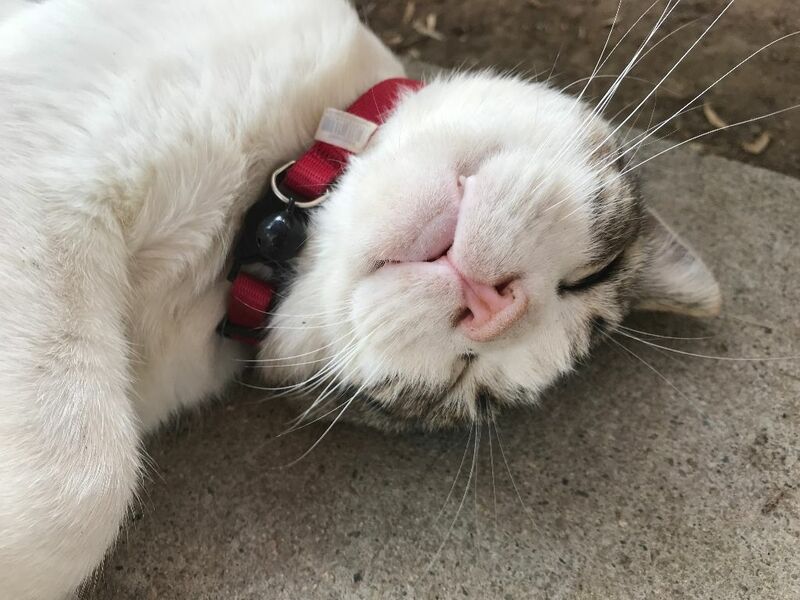 In early 2017, Feral Paws Rescue received a call from the CCSPCA (Fresno) asking if they would help with a cat who had a very bad injury that had caused tremendous swelling to his face. The shelter had already labeled this cat as “feral” since he didn’t want to have anything to do with the humans there. It was no wonder, since it was later determined he had been badly beaten. This handsome tabby and white cat was approximately three years old, and was given the name Trace, or Trace-Trace. Feral Paws Rescue didn’t know much else about him, if he had ever had a home or not. All they knew was that he feared humans and he desperately needed medical care and antibiotics. He was taken to the Rescue’s veterinarian, where he was checked for fractures or permanent damage. Thankfully, the wounds were superficial and were treatable with medication. So now the hard part began—getting him to trust those at the Rescue so he could be properly taken care of. Over a period of a few months, Trace slowly began to trust a couple of people at the Rescue and would allow only them to approach him. He was deathly afraid of strangers and it took time and patience to gain his confidence. Gradually, giving him medication became easier as Trace realized that the people who fed him and medicated him really cared, and weren’t going to harm him. Fast forward to today. Trace has made himself at home at the Rescue, where he will remain for the rest of his life. 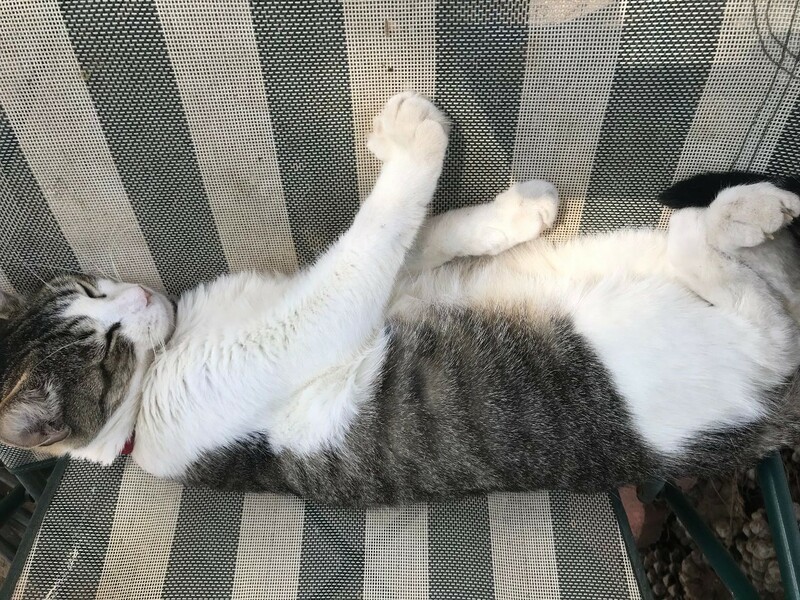 He loves to lounge on the patio furniture and especially loves to go inside the house where he can get on someone’s lap and be petted. He’ll also follow “his people” around the property at the Rescue, and when another cat needs a syringe of medication he still thinks it’s for him, so he’ll just get a little Pedialyte and he’s happy. Trace is still apprehensive around anyone new, but once he sees that a person isn’t going to give him anything but love, he immediately warms up to them, rolls around on his back and starts purring away. It’s always an awesome feeling to know that a life was saved, and that life has flourished with patience and a lot of love. 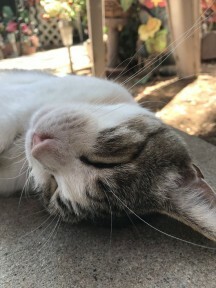 Trace is proof that not all cats who are labeled “feral” at high-kill shelters are truly that; most often they are just scared and need a little tenderness. What a handsome guy! Thank you for loving him ? I will never understand how human beings can be so cruel as to injure an animal?! I’m happy to see the cat is adjusting and doing so good!!! Great job!